And if there's never a point at which we stop growing, there's never a point at which we stop finding ourselves completely, utterly, frustratingly lost inside the many lanes that make up this life. I turn off the lights and close my eyes, only to jump out of bed moments later in search of a specific book. I grab the book, turn the light back on, and climb under the covers again. Three pages and a couple highlighted paragraphs later, I'm searching for my journal and scavenging for the right pen. I crack it open and write a simple sentence... "I'm feeling sad and defeated." I exhale and write a few more lines before rolling to my back and picking up my phone. I check Facebook. I snap a photo of the book and start Instagramming, but I never finish the caption, let alone actually post it. I'm staring at the ceiling, completely unsure if I want to scream or cry or maybe go to the gym. I do none of these things. I want to call my love and listen to him sing me sweet reassurances about life and business, but I don't. I want to take a bath with lavender bubbles and maybe some of my favorite music, but I don't. I want to give up on this day and go to bed, but I don't. It's only 6:30 p.m. I'm pretty sure I could sleep. I could cry until my eyes fail me... and then yes, I could sleep. I could make this day be over. But I don't do any of these things either. Instead, I simply close my eyes and breathe deep. I quiet my mind and allow myself to feel the agony inside. And I feel it with my whole presence, because the years have taught me not to be frightened or anxious about the unsettling inside my soul. Not to be discouraged or doubtful of the boundless darkness that threatens to consume me. They have taught me not to turn and run from what I'm being asked to face. Turned upside down and inside out. Restless. Aching at my core. Distracted by the deep discomfort that's buzzing through every cell and bone and vein inside my body. A decade of this work, and I still get lost. A decade of the questions, and I still don't always have the answers. A decade of the lessons, and I still feel like a total beginner. A decade of figuring it out, and I still get massively frustrated. 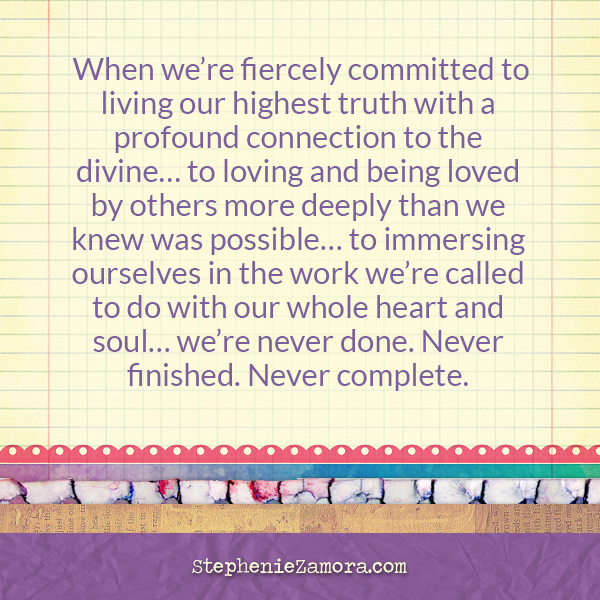 Because when we're fiercely committed to living our highest truth with a profound connection to the divine... to loving and being loved by others more deeply than we knew was possible... to immersing ourselves in the work we're called to do with our whole heart and soul... we're never done. Never finished. Never complete. There's never a point at which we stop growing. And if there's never a point at which we stop growing, there's never a point at which we stop finding ourselves completely, utterly, frustratingly lost inside the many lanes that make up this life. Asking the questions we thought we'd already answered. Learning the lessons we thought we already knew. 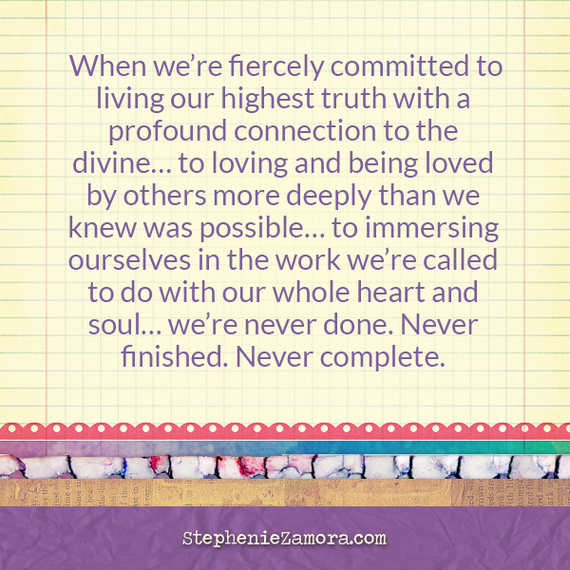 And doing the work more deeply and thoroughly than we ever realized was required. While these moments still catch me off guard, I've learned to welcome them with love and a lot of trepidation. Because in these moments I'm simply recalibrating. Aligning more deeply. Shifting more fully. Growing more wholly. I'm being asked to step it up. To move to the next terrifying life level. As soon as I remember this, I settle in and breathe more freely. My nervous system calms down and I'm able to think. Able to receive the direction and wisdom and answers I need to move forward. Able to take the actions I know I need to take. And because I've been doing a decade of this work, the alignments and shifts and growth happens quickly. The clarity comes and I lean in, wholeheartedly and terrifyingly fast. I align. I shift. I grow. I'm only ever stuck for what feels like a brief moment, because I've done this work for a decade. Because I've continually grown. Because I've worked with amazing mentors and coaches and healing modalities. Because I've never stopped learning... never given up. Because I continue to make the choice to do this work. To rise up after each and every fall. And I've put every single thing I've learned inside My Awesome Life Mastery so that you can align and grow and shift at a rapid pace too. So you can feel fulfilled, deeply connected, divinely guided, and fully supported. Mostly, so you can build a life and business around your passions with ease. Because the world needs more people who are willing to face what needs to happen to get unstuck. And if you're ready, I'm so ready to support you.